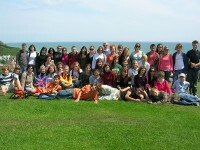 Our language school has acted since 2006 and at the moment we have more than 300 students each half year period. The name of our company ALRETE s.r.o. became from an English sentence ALways REady to TEach you. This slogan is our thought too. Although a large variety of courses teach English language, we teach You also German, French, Russian, Italian or Spanish. We want you to feel as comfortably as possible and that’s why we think about your needs. If you have too much work, and not enough free time to drink a cup of coffee or tea here you can fix one, free of charge. If you have forgotten a pen or paper, don’t worry, we’ve thought about this too, so anything you need, you will find in your classroom. We have a branch in Moravský Krumlov. In our new premises on Jana Schwarze street we have airconditioning. We now have more students, so we have larger premises, this year we have our first draft tests. 27.8.2010 we have a company called ALRETE s.r.o. We now have summer courses and courses in Tavíkovice. And also our first course in England, Hastings. We now teach Spanish and German, we had the first legendary Summer Intense Learning camp in Biskupice.